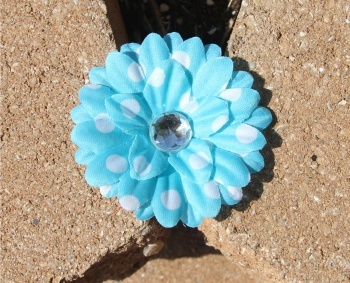 This is a sweet turquoise with white polka dots daisy flower. It is 2.25" wide in circumference, already attached to a white grosgrain lined alligator clip. All you have to do is slide right in your hair. This daisy is great for adding that flare to headbands or hats too! Everyone loves polka dots and that great turquoise color. The center is a shiny acrylic white stone.